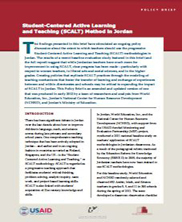 This policy brief focuses on World Education’s Student-Centered Active Learning and Teaching (SCALT) methodologies for teachers in Jordan. SCALT is a progressive teaching approach that facilitates students’ critical thinking, problem solving, analytic inquiry, team work, and project-based learning skills. It also provides students with 21st century knowledge and skills. World Education and Jordan’s National Center for Human Resource Development (NCHRD), with support from the USAID-funded Monitoring and Evaluation Partnership (MEP) project, conducted a 2011 national baseline study to examine how teachers applied SCALT methodologies in Jordanian classrooms. The study’s findings are included in this brief, and they have since stimulated an ongoing policy discussion about the extent to which teachers should use SCALT methodologies to improve children’s language, math,and science scores during late primary and secondary school years. This policy brief is an amended and updated version of one that was produced in early 2012 by a team of researchers and analysts from World Education, Inc., NCHRD, and Jordan’s Ministry of Education. World Education, 2013.